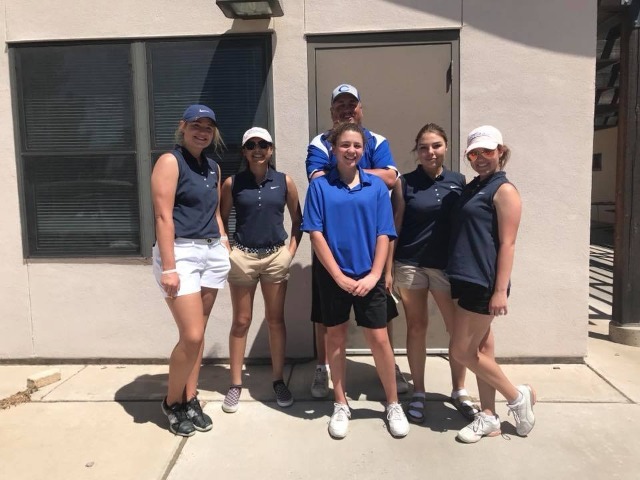 The cavegirl varsity golf team earned their first state qualifying score of the season with a team total of 381 Thursday at the nmmi golf course in Roswell. The score also gave the cavegirls the team title for the tourney. Junior Brycelin Ridgway led the cavegirls with an 89, her fourth individual state qualifying score of this season. Cavegirl freshman Cannon Hughes fired a 96, narrowly missing her fifth state qualifying score of the year by one stroke. Also just missing a state qualifying score was cavegirl freshman Winnie Keller who shot her season best 97. The fourth score kept by the cavegirls was a 99 by sophomore Caitlyn Sanchez. Carlsbad Junior Kaitlyn Walker shot a 105. The cavegirls finished first in the tourney which included golfers from Goddard, Roswell high, Hobbs, lovington, portales and tucumcari. Next up for the cavegirls is the district tourney Monday at Sonoma Ranch Golf Course in Las Cruces. If the cavegirls win the tourney with another qualifying score, they will qualify as a team for the state tournament in May at Farmington.